"In this stunning debut novel, a Kenyan expat living the American dream with her husband and adopted son soon finds it marred by child trafficking, scandal, and a problematic past. Mugure and Zack seem to have the picture-perfect family: a young, healthy son, a beautiful home in Riverdale, New York, and a bright future. But one night, as Mugure is rummaging through an old drawer, she comes across a piece of paper with a note scrawled on it-a note that calls into question everything she's ever believed about her husband . . . A wandering curiosity may have gotten the best of Mugure this time as she heads down a dangerous road that takes her back to Kenya, where new discoveries threaten to undo her idyllic life. She wonders if she ever really knew the man she married and begins to piece together the signs that were there since the beginning. Who was that suspicious man who trailed Zack and Mugure on their first date at a New York nightclub? What about the closing of the agency that facilitated the adoption of their son? 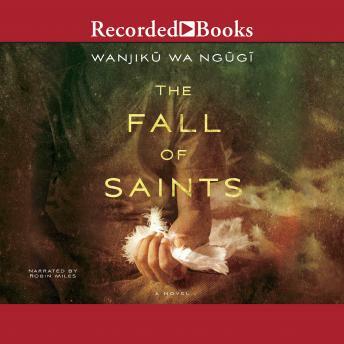 The Fall of Saints tackles real-life political and ethical issues through a striking, beautifully rendered story. This extraordinary novel will tug at your heart and keep it racing until the end"